"Flash of illumination", "Epiphany", "Eureka", "Magical movement" and the "aha" moment are some of the most common ways to describe insight. In the book "Seeing what others Don't" by Gary Klein discusses what the author believes causes us to gain insight. Gary Klein dissected over 120 stories, which he had collected over the years, to understand what causes us to gain insight, what stops us and how can we set ourself up in a manner that will increase our chances to gain insight and work past impasse. Some of the most famous (obvious) examples of insights that come to mind are that of the KeKule's discovery of the chemical structure of benzene after dreaming of a snake biting its own tail. or that of Archimedes discovering a method for determining the volume of an object with an irregular shape while taking bath. More recently, Gary Klein writes about an FBI agent who noticed an anomaly about the behaviour of some of the flying students. He observed that some of the Arab nationals who were undertaking flying lessons were not interested in either learning how to take-off or landing, all they wanted to learn was how to navigate the plane in the air. 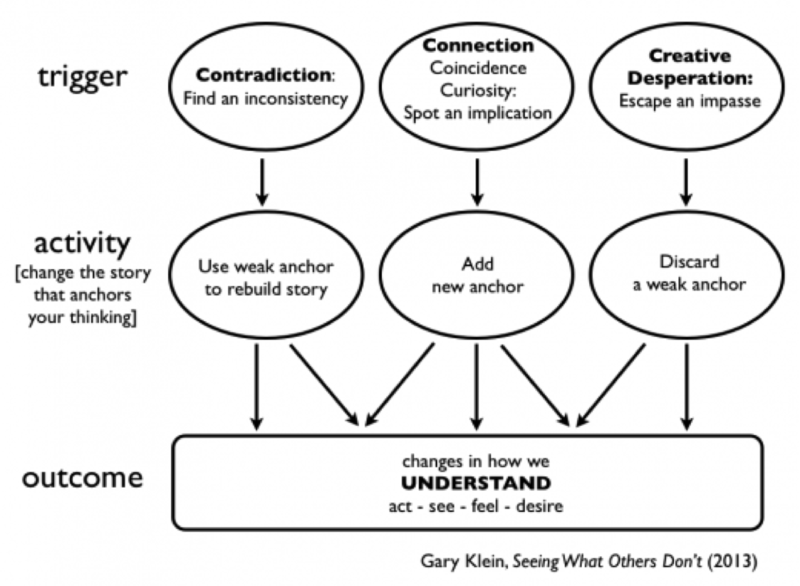 The research by the author, Gary Klein, concludes that there are five known ways in which we gain insight. I discuss each of them using five stories from the book. Charles Darwin, driven by a keen interest in natural history, went on an unpaid five year expedition (1831-1836) with a leading botanist John Henslow, making detailed observation of variations he saw in animal species between island and different geographic regions. Upon his return to England he wondered what drove the variations? In 1798, Reverend Thomas Malthus wrote ‘An essay on the principle of Population’, which claimed that populations grow until they exceed the food supply and then the members of the population compete with each other. In fact, Darwin was not alone in making this connection, Wallas, a British naturalist also made the same conclusion inspired by Thomas Malthus' essay. The idea that stress causes stomach ulcers was thwarted by an Australian fellow named Barry Marshall in 1993. Barry Marshall eventually went on win Nobel prize in 2005 for his contribution to medical science. "Why zebras don't get ulcers" is a brilliant book by a primal research scientist, Robert Sapolsky. In his book, Robert Sapolsky, writes about the adverse effect of chronic stress on one's health, leading to increased risk of disease and disability. It was first published in the year 1994. Since, then it was been re-published at thrice, with the last one being in Sept 2004. The idea that ulcers (stomach) are caused due to stress was so deeply rooted that, Robert Sapolsky - leading Stanford University botanist, choose to use the word ulcers in the title of his book. Never mind the fact that the stress theory had been disproven a year ago. The treatment for stomach ulcers was either going through scissors or drugs. Tagamet (Smith&Kline) and Zantac (Glaxo) were two of the most successful drugs of 1970s and 1980s. These drugs were supposed to help patients with stomach ulcers. With billions of dollars at stake, one can imagine the huge bias the pharmaceutical companies had to defend the theory of stress causing ulcers. In 1981, Barry Marshall, who was taking third year of specialised training to become a cardiologist, started working with Robin Warren, a pathologist. He found a strange correlation between chronic stomach pain and a bacteria that the pathologist had discovered. When Barry Marshall looked closer, he found two of his formal patients who suffered from chronic stomach ulcers. One of them was a middle a middle aged woman who was put on anti-depressants when doctors (and lab test) could not find anything wrong with her. The other was the case of an eighty year old man, who due to his age could not under-go the surgery for stomach ulcer, was given antibiotics. To Marshall's surprise and amazement, the patient returned couple of weeks later relieved of his pain. Marshall reviewed the medical research material going back to 1892 and found a strong correlation. They submitted their findings in 1983, but were turned down. Following which Marshall applied for funding to perform clinical test. He received a grant of $100,000. Unfortunately, the samples from first 37 patients that were sent to pathology lab to test for the presence of bacteria (H. Pylori) all came back negative. Marshall persisted. As luck would have it, due to the outbreak of flu (or something along those lines) one of the samples was left untested for almost two weeks. After the pathology operations resumed at the lab, this sample came out positive. This was it, Marshall reasoned that it took the bacteria approximately two weeks before it could be detected in the lab. He instructed the pathologist to leave the samples for two weeks before testing & discarding the samples. Marshall received another 12 patients before the end of the year and all of the samples tested positive. At the end of the year, he submitted his research finding, only to be turned down once again and face loss credibility. When everything else failed, Barry Marshall, did the unthinkable. He successfully infected himself with the bacteria hoping to prove his theory. Unfortunately, this yielded no results either. In fact, it wasn't until the Readers Digest in early 1990s published Marshall self-experiment story that medical community accepted his theory. Medical community believed that unsanitary conditions caused yellow fever. Finlay, who worked in Cuba for over decade was curious to find out the correlation of Aedes (mosquito) and the yellow fever. His research concluded, when the temperature got too cold for the mosquito, yellow fever disappeared, only to reappear the next summer when the temperature rose and the mosquito returned. The Aedes didn’t tolerate higher elevations, and the people who lived at higher elevations escaped yellow fever. Unfortunately, when he collected evidence to prove his theory, it came back negative. Another doctor names Walter Reed, observed that one of the jail inmates was suffering from the yellow fever. Reed was curious to understand that if yellow fever was caused by unsanitary conditions and not mosquitoes, why only one of the inmates came down with it and not others. After all, they all shared the same environment. Around the same time there was another outbreak of yellow fever in the southern part of the country. He observed that it a ship carrying immigrants had landed couple of weeks earlier. Walter Reed suspected that it took around two weeks for the virus to incubate within the mosquito before it could be transmitted. Reed performed the same experiments that Finlay had performed, but this allowing the virus the incubation period of two years. And voila! the evidence proved that yellow fever was caused by mosquitoes and not unsanitary conditions. While most of the investors lost their life savings as a result of subprime mortgage crisis that unfolded in the year 2008, there were a handful of savvy investors who were able to identify that the tsunami of financial turmoil was on it way. A jobless, penniless man behind on his CC offered a loan to buy a home he couldn’t afford. Contrary investors wondered, if the housing market was going strong then, why did the lending institutions have to go after less qualified buyer? Defying gravity – subprime growth rate continued to rise even as interest rates were rising. Rating agencies (S&P/Moody’s) credit rating model was built on the assumption that home prices will always go up. In fact, the model was not designed to work with flat or falling house prices. 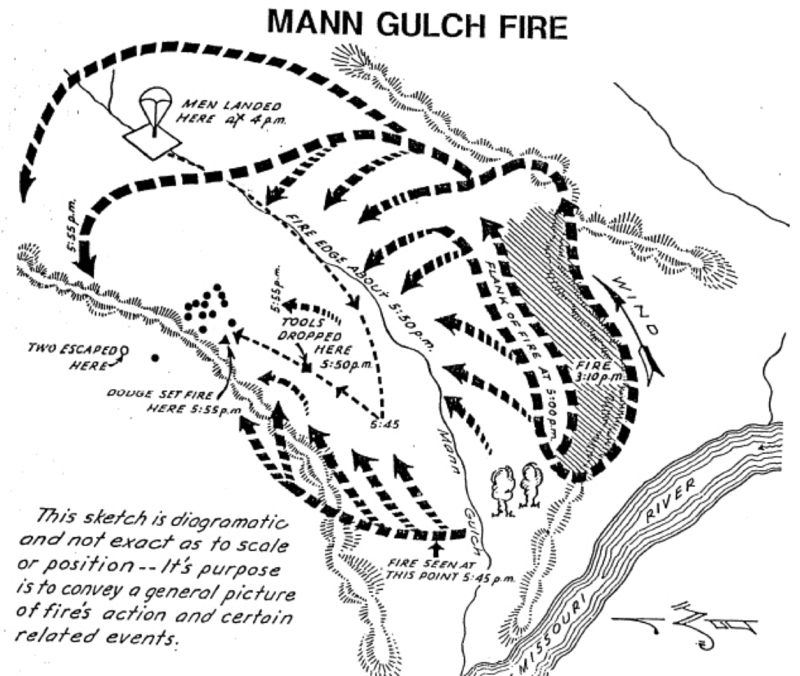 The Mann Gulch fire was a wildfire reported on August 5, 1949. Of the team of 15 firefighters only three survived. Wagner Dodge was one of them. With the fire less than a 100 yards behind he took a match out and set fire to the grass just before him. In doing so, he was attempting to create an escape fire to lie in so that the main fire would burn around him and his crew. Wagner Dodge's solution was that of creative desperation. "Insights transform how we see; we look for different things in keeping with our new story. Compared with routine problem solving, insights aren’t conscious or deliberate. They come without warning. Insights are disruptive in that they don’t let us retain our comfortable beliefs. Instead we have to modify the core beliefs that anchor our understanding. We abandon some beliefs/anchors and revise others. The two paths also lead to the same kinds of outcomes. We change what we understand. In addition, we sometimes change our ideas about the actions we can take, the way we see situations, how we feel about things, and what we desire." Personally, I disagree with the author on this one. I believe that Gary Klein has gone at great length to bash people/organisation focused on eliminating or reducing errors. I believe eliminating and/or reducing obvious and expensive mistakes can take one a long way. In the book "Extraordinary Tennis Ordinary Players", author Simon Ramo identifies a crucial difference between a Winner's game and Loser's game. He writes, "if you choose to win at tennis – as opposed to having a good time – the strategy for winning is to avoid mistakes. The way to avoid mistakes is to be conservative and keep the ball in play, letting the other fellow have plenty of room in which to blunder his way to defeat, because he, being an amateur will play a losing game and not know it." In the words of Charlie Munger, "It is remarkable how much long-term advantage people like us have gotten by trying to be consistently not stupid, instead of trying to be very intelligent. There must be some wisdom in the folk saying, `It’s the strong swimmers who drown.'" Gary Klein says that one of the side effects of bureaucracy is organisational repression. In order to fight organisational repression, the author (Gary Klein) suggests to setup an insight department similar to innovation department. I find this quite contradictory as setting up yet another department is akin to introducing yet another layer of bureaucracy, implying bureaucracy is the answer to bureaucracy. Is insight a matter of breaking out of an impasse? Yes, for the creative desperation path, but not for the others. Does incubation help? The evidence is mixed. Does experience get in the way of insights? Sometimes, on the creative desperation path, but not on the others. Should we keep an open mind? Yes, on the connection path, but not on the contradiction path. Should we expose ourselves to lots of swirl, lots of different ideas? Perhaps for the connection/coincidence/curiosity path, but not for the others. Should we solely focus on the evidence and data? Again, the evidence is mixed. I found this book quite insightful, although, its not a be-all and end-all.